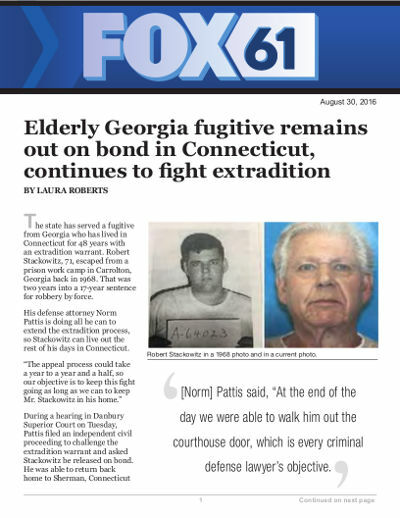 The state has served a fugitive from Georgia who has lived in Connecticut for 48 years with an extradition warrant. Robert Stackowitz, 71, escaped from a prison work camp in Carrolton, Georgia back in 1968. That was two years into a 17-year sentence for robbery by force. His defense attorney Norm Pattis is doing all he can to extend the extradition process, so Stackowitz can live out the rest of his days in Connecticut. During a hearing in Danbury Superior Court on Tuesday, Pattis filed an independent civil proceeding to challenge the extradition warrant and asked Stackowitz be released on bond. He was able to return back home to Sherman, Connecticut after posting just $100 bond at the civil proceeding. Pattis is arguing Stackowitz has numerous health problems and sending him back to Georgia would be a death sentence. He also intends to take the case to federal court arguing extradition under these circumstances falls under cruel and unusual punishment. “Today was terrifying. I thought the judge was going to deny bond and Mr. Stackowitz was going to be taken into prison where he would have most certainly died,” said Pattis, after Tuesday’s hearing. Stackowitz was arrested on May 9 in Sherman, CT where he had been living peacefully for years while working as a boat repairman. His application for social security played a role in his capture, according to authorities. He is due back in court on September 26, when a judge could decide to reconsider his bond.